There is a great deal of evidence in Charles Dickens’ novella “A Christmas Carol” to suggest that Ebenezer Scrooge lives within a solipsistic universe. Solipsism is the theory that the self is all that can be known to exist and possibly all that does exist. If Scrooge did in fact live in a solipsistic universe then the world he perceived himself to live in including all the other people inhabiting that world would be merely creations of his own mind. They would therefore have no real form or substance of their own. In his solipsistic universe only Scrooge would exist. This must be distinctly understood, or nothing wonderful can come of the idea I am going to relate. For the purpose of understanding I submit the following exhibits into evidence. Scrooge himself felt very alone in the world. Dickens describes him as “solitary as an oyster” and that “… the very thing he liked [was to] edge his way along the crowded paths of life warning all human sympathy to keep its distance…” He lived alone in a dark, empty, “gloomy suite of rooms, in a lowering pile of building up a yard, where it had little business to be …” hidden behind other houses. I have read many books on dream interpretation that interpret a house in a dream to represent the human mind. If it was Dickens’ intent to have Scrooge’s house represent his mind I think the metaphor is apt. Finally, Scrooge pushed all other people aside as if they were truly “surplus population” and not entirely real to him. We see this when his nephew comes to his office to invite him to dinner, when the two solicitors visit and when the child sings a carol on the steps of his office. We also see it quite clearly in the way he treats his clerk, Bob Cratchit. Scrooge’s go to catch phrase is “Bah Humbug.” In my last post we discussed how the actual definition of “Humbug” is “language or behavior that is false or meant to deceive…” It is this deception that lies at the heart of the solipsistic universe. In other words, the other people in Scrooge’s world are not separate beings but rather creations of Scrooge’s mind. The fact that they appear to be separate on the surface level is the deception. Scrooge sees his universe as a humbug because the truth of it is not how it actually appears. In a sense there are two minds at work; one that is of the universe and lives within it (i.e, his ego) and one that is aware of the falseness of the universe (i.e., his true self). 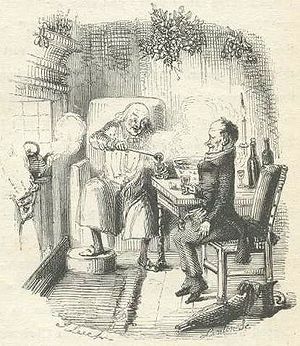 Marley’s ghost tells Scrooge that the purpose of his visit is to warn Scrooge that he has a chance to escape Marley’s fate. Scrooge sees that Marley is fettered with a ponderously long and heavy chain. Marley tells Scrooge he wears the chain he forged through his neglect of his fellow man and that Scrooge’s chain was as heavy as Marley’s chain currently appears to be seven Christmases ago. Scrooge is not aware of his own chain but the implication is clear that he will become painfully aware of the chain once he dies. When Marley first appears, Scrooge explicitly states that he does not believe Marley is real and that he assumes Marley is a creation of his own imagination. There is then a dialog where Marley’s ghost attempts to convince Scrooge that he is real. Scrooge argues that Marley is probably the byproduct of poor digestion. This is not particularly convincing but it illustrates the point that Scrooge assumes himself to live in an (at least somewhat) solipsistic universe. Marley finally frightens Scrooge into admitting he believed in Marley. But what exactly does this mean that Scrooge “believed” in Marley? I think the only logical answer to this question is that when Scrooge says he believes in Marley he means to say he believes Marley is a separate person and therefore repudiates his own belief that he lives in a solipsistic universe. Perhaps this is repudiation is necessary in order for Scrooge to believe the redeeming power of the apparition. Perhaps this belief is necessary for his redemption. But even if Scrooge is forced to admit that he does not live in a solipsistic universe this does not necessarily prove that his universe is more than just his mind. Consider the question, why was there no ghost that appeared to Marley before he died? Why does Scrooge deserve this chance at redemption and not Marley? It could be argued that Scrooge actually deserves redemption less than Marley given the relative sizes of their respective chains. The fact that Marley appears for Scrooge’s sake but no ghost appeared for Marley’s sake appears to be evidence that Scrooge does in fact live in a solipsistic universe. The final piece of evidence I will present to support the argument that Scrooge lives in a solipsistic universe is what the Ghost of Christmas Past says to Scrooge when he makes his introduction. When he tells Scrooge who he is, Scrooge replies, “Long past?” to which the ghost counter-replies, “No. Your past.” The ghost is in effect telling Scrooge that his whole reason for being is for Scrooge’s benefit. In a sense the ghost would not have a reason for being if Scrooge did not exist. This only makes sense if Scrooge lives in a solipsistic universe. One can assume the subsequent ghosts exist for the same reason. I think it is important that Scrooge’s universe is solipsistic because it explains both how and why his redemption takes effect. First of all, there must have been a repressed subconscious part of Scrooge that desired redemption. This subconscious part of him was his true self that had been suppressed by an overbearing ego. This ego had its genesis in Scrooge’s mother who died in childhood and his father who blamed him for his mother’s death. 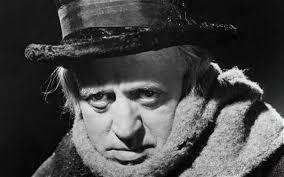 Scrooge “feared the world too much” and built up defenses against it by allowing his ego to take control. With the onset of advanced age his true self reached a point where either redemption happened now or it would never happen. Because Scrooge lived in an egocentric solipsistic universe his subconscious true self was able to send Marley and the three ghosts to ferry Scrooge through the redemption process. This redemption process, however, was a transformation from solipsism to a world where the other had real form and substance. In a solipsistic universe, there is only the self. The “others” cohabitating this universe have no real existence. As such, they can be easily marginalized as “surplus population” and treated as lesser beings. But this is a lonely, dark, hostile and ultimately undesirable world to live in. When one lives in that world for too long he becomes like Scrooge; angry, bitter, afraid and distrustful of the other. Redemption can only happen when one frees himself from the shackles of the ego and migrates from its self contained, solipsistic universe into the real world in which the other exists with real form and substance. In order for the command to love thy neighbor to be meaningful, the neighbor must be real and other. Otherwise love of neighbor is merely a love for a phantom created by the mind. In the final stave Scrooge is relieved to find himself alive in his bedroom on Christmas morning. He has time to make amends for his prior acts. As he frantically dresses he looks around the room and remembers the events of the previous night. He laughs for the first time in many years and realizes he does not know what day or time it is. As the church bells toll he opens the window and yells down to a boy on the street. When asked the boy tells him it is Christmas Day. He realizes the spirits had transacted their business all in one night despite what Marley had told him about when to expect the ghosts’ arrival. This is a strange discrepancy, the significance of which has never been explained to my satisfaction. He sends the boy off to get the prize turkey in order to send it anonymously to Bob Cratchit. Scrooge is delighted by the boy. This seems to be the culmination of a theme starting with the caroler Scrooge mistreated on Christmas Eve, Scrooge’s child self, Tiny Tim, and the children duo Ignorance and Want. As Scrooge waits at the door he sees the knocker says he will love it forever. The poulterer arrives, Scrooge pays for the turkey and sends him in a cab to Bob’s house. Scrooge also pays the boy. Scrooge then returns to his room, shaves happily and dresses himself in his best clothes. He walks through the streets addressing everyone happily. He meets the two men he had rebuffed on Christmas Eve seeking money for the poor. He apologizes and tells them he will give them money. He then goes to church and walks the streets. In the afternoon Scrooge arrives at his nephew’s house. Fred welcomes him happily. This scene has always been very powerful for me. I always react emotionally when Fred welcomes Scrooge to his party. It is the Biblical scene where the father welcomes home the prodigal son. It is the scene where God welcomes us home after our struggles on Earth. The next day Bob Cratchit arrives late to work. “What do you mean by coming here at this time of day?” Scrooge asks him pretending to be angry. Bob confesses that he was “making rather merry” the day before. I suppose this means he drank too much and overslept or was hung over. But Scrooge tells him he will raise his salary and help his family and that they will discuss his affairs over a “smoking bowl of Christmas Bishop” (whatever that is). Dickens tells us that Scrooge was as good as his word and Tiny Tim did not die. He also mentions that some people laughed at Scrooge for changing. In other words they tried to shame him for changing. This certainly fits the pattern of shame-based people. They fear change themselves and become jealous when they see other people change so they try to stop other people from changing by shaming them. Scrooge, of course, was unaffected because through the intercession of Marley and the three ghosts he had surpassed this shame-based circle. He was indeed a new man. Were the three ghosts real? That is, were they separate entities intervening in his life for his benefit or were they parts of his subconscious mind fed up with the status quo and affecting their own healing? The fact that Marley had no one intervene on his own behalf suggests the latter. This is certainly a topic that can be explored in greater depth. Anyway, I think I am done with “A Christmas Carol” for now.